White House press secretary Josh Earnest on Friday called Sen. Chuck Schumer’s (D., N.Y.) decision to oppose the Iran nuclear arms agreement "disappointing," hinting that it may prevent him from ascending to the top Democratic post in the Senate. National Journal reported that Earnest told reporters Friday that Schumer’s vote, made public in a post to Medium Thursday night, was "not particularly surprising to anybody here at the White House, even if it was disappointing." "But it doesn’t change that we will be able to mobilize a substantial majority of Democrats in the House and Senate in support of the deal and, if necessary, to sustain the president’s veto," Earnest added, dismissing the effect the negative mark could have on the deal, which Obama has been tirelessly selling in the weeks after it received final touches in Vienna. 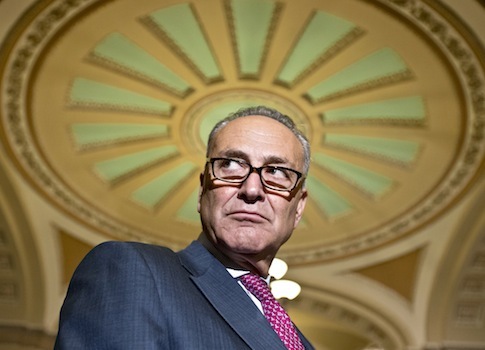 Schumer, the most influential Jewish member of Congress, is a top contender to assume the position of Senate Democratic leader when Sen. Harry Reid (D., Nev.) relinquishes the post in 2016. While Earnest did not specifically say Schumer’s negative vote would hinder his election to the position, the White House spokesman said generally that he "wouldn't be surprised" if Democrats thought about "the voting record of those who would like to lead the caucus" when voting on Reid’s successor. In his post to Medium, Schumer provided a detailed account of his assessment of the nuclear arms deal with Iran, criticizing the agreement for its "serious weaknesses." "If Iran’s true intent is to get a nuclear weapon, under this agreement, it must simply exercise patience," Schumer argued. "After ten years, it can be very close to achieving that goal, and, unlike its current unsanctioned pursuit of a nuclear weapon, Iran’s nuclear program will be codified in an agreement signed by the United States and other nations. To me, after ten years, if Iran is the same nation as it is today, we will be worse off with this agreement than without it." While "disappointed" in Schumer, Earnest refused to lump the liberal lawmaker in with Republicans who have expressed staunch opposition to the deal. "Senator Schumer at least read the agreement, talked to the experts who were involved in negotiating, spent time talking to experts who understand the nuclear basis for some of the strategic conclusions that were reached by our negotiators," Earnest said. "That at least demonstrates a willingness to consider the arguments of the other side. And just we were disappointed that he didn’t ultimately reach the same conclusion that we did." Members of the House and Senate have 60 days–or until the middle of September–to review the deal. Lawmakers would have to pass a resolution to kill the agreement, which would need two-thirds majority support in order to override a veto from Obama. The president has been attempting to sell the agreement to Democratic lawmakers in private and public. Upon announcing the deal on July 14, the president vowed to veto any effort by Congress to reject it. According to a Quinnipiac University poll out this week, American voters oppose the deal by a 2-to-1 margin. Obama is embarking on a 17-day vacation to Martha’s Vineyard, Massachusetts, Friday evening, after which he will return to the White House and continue to push the nuclear arms deal as Congress moves closer to its deadline. This entry was posted in National Security and tagged Barack Obama, Chuck Schumer, Iran, Nuclear Weapons. Bookmark the permalink.